Supplied in 100ml amber glass bottle with dropper and tamper evident cap. MSDS & Allergens cert available on request. Oil Properties Lemongrass oil has a lemony, sweet smell and is dark yellow to amber and reddish in color, with a watery viscosity. Origin It is a perennial fast-growing aromatic grass, growing to about 1 meter (3 feet) high with long, thin leaves and originally was growing wild in India. It produces a network of roots and rootlets that rapidly exhaust the soil. In India it is known as ‘choomana poolu’ and is also referred to as ‘Indian Verbena’ or ‘Indian Melissa oil’ and used in Ayurvedic medicine to help bring down fevers and treat infectious illnesses. It is a valuable ingredient in perfumes and citrus-type soaps and is also an insect deterrent. Extraction Lemongrass oil is extracted from the fresh or partly dried leaves by steam distillation. Chemical Composition The main chemical components of lemongrass oil are myrcene, citronellal, geranyl acetate, nerol, geraniol, neral and traces of limonene and citral. 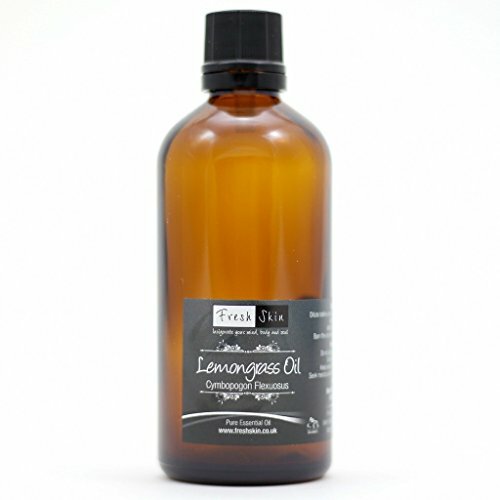 Precautions Lemongrass oil can irritate a sensitive skin, so care should be taken. It should be avoided in pregnancy, due to it being a possible skin irritant.